I am on the Mysore-Mayiladuthurai Express, a long and rather wonderful royal-blue train that cuts through interior Karnataka and Tamilnadu. Mysore, where it originates, is like the humanities department of a great university, churning out stalwarts in multiple areas: R.K. Narayan the writer; R.K. Laxman the cartoonist; T.S. Satyan the photographer; Thirumalai Krishnamacharya, Pattabhi Jois, and B.K.S. Iyengar the yoga masters; the Mysore school of musicians including Mysore Vasudevachar and Veena Doraiswamy Iyenger among others. What is it about that gentle city that churns out such creativity? Is it the pace of life or some additive in the water? The final destination is Mayiladu-thurai, which means the “place/port in which peacocks dance.” I am getting off in Kumbakonam however, because it is the gateway to the great Chola temples of Tamilnadu. There is no easy way to get to Kumbakonam from Bangalore. Red Bus is the best option but my parents are dead against me travelling overnight by bus. They don’t bother much when I travel by planes except to get broad date of travel and return. Trains and buses, they understand. So they’ve jumped in and pulled me back to the time I was a 16-year-old. The waitlist clears on the train and the advice pours out. “If you get a side berth, make friends with the T.T. and shift to an inside berth,” says my mother. “Upper berth is better than lower.” “Don’t wear jewelry.” “Take a metal chain and bolt your bag to the berth.” “Lock your bag.” I inhale deeply and try to enjoy the parental concern. 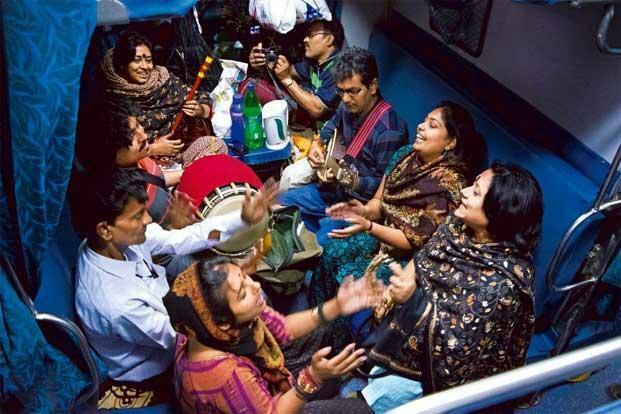 Trains, along with cricket, Bollywood and food are cultural touchstones. They are part of our collective unconscious and define us as Indians. The farther we go, the more we long for the trains of our childhood. I know an executive who works at Louis Vuitton. He wants to take his children on trains “third class or unreserved, just like we used to as kids.” What is it about trains that produces this yearning? Perhaps it is the commonality of experience. Perhaps it is memories of childhood trips with parents who are relaxed and expectant about joys to come. Perhaps it is memories of quarrelling for a seat in the unreserved compartment to get to a marriage of people you didn’t like and spending a sleepless night stuffed beside strangers who turned out to be not so bad after all. Or perhaps it is simply the comforting chug of the engine, the toot of the horn into the night sky, and the rhythmic click-clack of the wheels. No other mode of transport save trains can duplicate an experience that offers the best and worst of travel. Planes in contrast are anemic, sanitized and soul-less. Take my own trip on this ordinary train, no different from those plying Punjab and stopping at Bhatinda; or those in Rajasthan between Jodhpur and Dungarpur. Trains connect India. Want to go to Ujjain in Madhya Pradesh from Kakinada in Andhra Pradesh? No better way than to catch a train. Want to get to nearby Kumbakonam from Bangalore? Train it is. The rituals surrounding train travel are both universal and specific. You buy your Patrika, Dainik Jagran, or Dinamalar newspaper from the railway stall; throw in a bottle of water and maybe a zarda-paan or two. Depending on the station, vendors will walk by with regional specialties: hot milk in Erode station; matka dahi or curds; chikki; samosa or packaged idlis. You buy your tiffin, lunch or dinner in case you haven’t brought it from home and await the train. The chugging in is always a thrilling sight. I think it has to do with perspective and proportion. Train engines are designed for the human eye: not as large or ungainly as an airplane. The rectangular blue box that is the engine appears in the distance, usually rounding a curve. Then it pulls in and everyone rushes to board—bag, baggage or suitcase in hand. In the old days, my family travelled with a magnificent contraption that we called a “hold-all.” It held some razais or dhurries to cushion us on the metal berths in second-class; and held clothes, towels, shoes and assorted travel accouterments. Today, everyone pulls along a wheelie and the red-uniformed porters stare at their waning business bereft. Indians react to train departures like no other nation. We stand around, holding hands across the window and passing food. We are a culture of prolonged goodbyes. Our boundaries are porous, whether it is between people (no concept of ‘personal space’ in India); or spaces (inside and the outside merge in our psyche). We pass food and drink to relatives through train windows. My friend, Shelja Rathore, still does this in Jodhpur, arriving at the station at all hours of day and night to hand over homemade kachoris or rotis to travelling relatives as a token of love and concern. We ask routine questions: are you okay, how was the journey, pass on my inquiries to bhaiyya/bhabhi/nana/chachi/insert honorific. Perhaps that is all we need to connect: food and a porous train window. Nothing matches the high drama of a train departure. Where else can you run beside the train, holding on to hand, finger, then little finger, then scarf, before letting go and waving till the train disappears. You certainly cannot run after an airline; and you’d bump into the passing cow if you tried this stunt in inter-city buses. Trains are designed for our sort of goodbye. Everyone is running, sobbing, yelling out instructions, and then frantically waving goodbyes and asking the traveller to call the moment the train reaches destination. Shoba Narayan runs besides trains and buys banana leaf packets of hot steaming idlis at every possible station. I love train journeys, and rediscovered my lost love for them during a train journey to the not so touristy Sarai Rohilla to Bikaner route, that passes through such marquee names like Rewari, Loharu, Jhunjunu ( yes the birthplace of forefathers of Jhunjunuwalas of toda ) and Churu etc. I think the trains still retain those sights and smells that take you back to childhood, and while more people may travel in AC dubbas, the Janata janardan and the theplas, and poori achar or Idli with chutney have encroached there also. I love trains, and this is such a wonderful post….